Within the town of Berlin one of the largest gatherings of the community is during the Labor Day parade. It is a great day to honor our veterans while enjoying a parade down the main street in the center of town. Organizations such as Boy Scouts and Girl Scouts march alongside retired veterans and the high school and middle school bands play music while they march in step to the music. Local youth sports teams walk with their coaches down the road while handing out candy to neighbors who line the streets. After the parade there is always a barbeque where everyone is welcomed and the bands play more music while people dance and the chorus from the high school sings. There are 1,203 veterans living in Berlin, which accounts for approximately 5% of the town’s population. It is nice to know how much our town respects its veterans and everyone is willing to come out and show support for them. From an early age parents bring their children to the parade and it becomes embedded in their mind that the parade is just something you do growing up in Berlin. Everyone in the town seems to be involved in a sports program through a family member or being on a team himself or herself. It is nice to have the sports teams participate in the parade to show our support for them at the youth level. 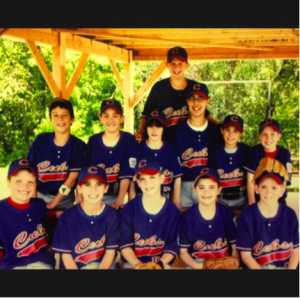 Growing up it seemed everyone was part of a sports team and it seemed to bring a lot of culture to our town in the form of athletics. Becoming aware of body language and how to conduct yourself in public in front of others while on the field is something I was able to take with me through life. US Census Bureau (2011). Veteran population for Town of Berlin, CT. Table S2101. Washington, DC.